If you would like to see the Broads from another perspective then why not opt for a canoe hire or cycle ride. The Broads is a huge amount of woodland, fields and waterways and there are so many hidden treasures which can only be found on foot, or in a small boat. When you’re on your Norfolk Broads holidays, take a bike ride or hire a canoe and explore some of the less-known areas of the Broads National Park. Located at BeWILDerwood, Hoveton. 07887480331. Moor up in Horning then walk to BeWILDerwood. We work closely with Broadland Cycle Hire – more information about discounts for our customers can be found here. 01692 631120 / 07768108818. Moor up at Ludham Bridge. Clippesby Hall, near Acle. 01493 369221. Moor up at Thurne Mouth, approximately 2 mile walk. 01493 750470. Moor in Stokesby. 01603 722775 / 07795145475. Moor at Salhouse Broad. Burgh St Peter. 01502 677343. Moor up at Waveney River Centre. 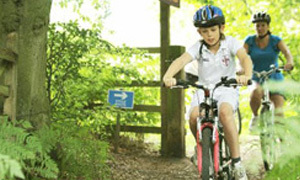 There are more bike hire centres available, but some are not as easy to access from the river. Wayford Bridge. 01692 582457. Moor up at Wayford Bridge. You can hire canoes for up to 3 or up to 6 hours (£23-£35). Salhouse. 01603 722775 / 07795145475. Moor up at Salhouse Broad. 01692 581653. Moor at Sutton Staithe. Potter Heigham. 0800 1444472. Moor at Herbert Woods. Potter Heigham. 01692 670460. Moor at Repps Bank. Canoeing is a great way to explore some of the quieter waterways; not only is it good exercise but it can be a peaceful way of seeing some of the Broads’ unique wildlife. More canoe centres are available, but we’ve picked the ones that are easiest to moor close by.